Please note that different localities have different groupings of Ice Saints. The Episcopal church commemoration of Boniface confuses things (he is June 5). The other Ice Saints are not commemorated in the calendar, nor are there any commemorations May 11-14. The BBC Evensong broadcast typically does celebrate one of the Ice Saints, with the annual broadcast of Evensong from St. Pancras Church, as part of the London Festival of Contemporary Church Music. This year's broadcast is now available for listening online (or will be shortly after this post), and will remain available for the next week. "You can kill people with sound." Arvo Pärt says this in this revealing conversation with fellow musical innovator Björk. This video is a blast from the past. We previously blogged about it in a post with the rather ingenious title "madness - umlaut". And when we think about the nature of music, we are confronted with music's "power". This inherent property of music is simultaneously reassuring and terrifying. Of course, sound is literally energy. So is light. So is everything around us. And it leads us to think about the nature of this mysterious spiritual "power" of mysterious things in this world in which we live. Our bodies are, perhaps, centers of this mysterious power. Or at least nodes in the matrix-fabric of universal power-ness. Or something. How do we use our bodies, these engines of creativity and performance? 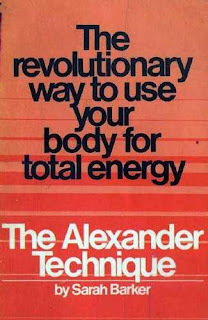 This and other questions come to mind as I consider the wonderful subtitle to Sarah Barker's book The Alexander Technique, "the revolutionary way to use your body for total energy". Wild. Total energy. What is that? "In art everything is possible, but everything [that] is made is not necessary." It's surely possible to use this energy for good. As Pärt suggests, to use it for life. Time to kill some yaks.